Sherwin-Williams is pretty awesome... 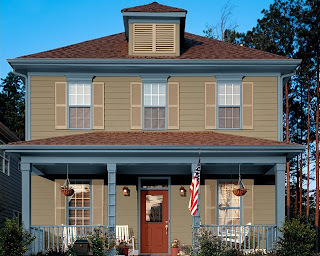 I put together these color schemes on a model house online--ours actually looks a lot like this, even down to the reddish roof. This is the Weathered Shingle with the green trim mentioned earlier, and also with a blue trim, which we were planning on originally. I like both. The blue is so fresh and snappy! But is definitely leaning towards Colonial. The green is more historically accurate for Arts and Crafts/Four-Square. I could use some input. Here's the back wall and entrance to the powder room nook. We got a couple new windows. Unfortunately, they were installed too low, so when you stand to look out of them, the top of the window is eye level... Yeah, that's being fixed. Dining room. FINALLY! As you can see, we have some dust. Looking into the powder room nook from the dining room. Ultimately, we're putting a swinging door in there, but for right now, I'm just pleased to not be able to see the kitchen from the dining room. Weathered Shingle or Bunglehouse Grey? Wait. What's a Bunglehouse? So, it's a quiet Saturday night. We're surrounded by boxes, disarray, and poor lighting (lamps are packed). As always happens at times when we don't have much else to do, we started to talk about the House. I'm going to start referring to the house as "House" because she/it is truly becoming a member of our family. House certainly costs as much as a child would. Probably more, given a child doesn't require a licensed electrician. We're debating over several color schemes. Initially, we had sort of settled on a beige color, with dark blue trim and a red door. The red door is non-debatable--it's very feng-shui and I sure like the way it looks. But House is just monstrous, and that would be quite a bit of beige, and I don't want it to become the equivalent of khaki pants in our vibrant neighborhood. We've landed on a couple alternate schemes. I'd love your input! VERY brown to me, but we did a little computer-aided design and it looks quite nice. "Bunglehouse Grey" - we did the same modeling with this grey scheme, and the grey is too dark. Lightened up just a couple shades, though, it looks fantastic. This would also very nicely complement the limestone steps leading up to the front porch. I also think these two trim/accent colors are pretty much perfect. Speaking of the front porch... The house, of course, is 108 years old, and we think the porch was originally built on sand. Obviously, it's shifting a bit. We simply can't just destroy the porch and start again (though this is what Eric wants to do, of course...). We also have no wiggle room to just put a layer of concrete on top of the existing slab, because we have like a half inch between the porch floor and the doorframe. Ultimately, once we settle on a solution, which I'm thinking will likely involve some sort of middle ground between my idea to just cover up all the imperfections, and Eric's idea to rebuild the whole porch, we'll see about staining the concrete. Regardless of what main color we choose, I think we'll go with a nice stain that blends grey, green, and brown together. Here are some videos for your viewing pleasure. In keeping with my theme of "Cute Animals" these feature both puppies and kitties. Though you all know I love the puppies more. Bless you if you have the time to watch all four--you will be rewarded with cuteness beyond your wildest dreams. So sweet, this might give you diabetes. Eric has been hassling me for ages, asking me to put some of the better pictures up. It's a long story, but that I haven't yet all comes down to the fact that the better pictures were on his computer, not mine, and that I emptied the camera. Anyway, I have a holiday today, and Eric is at work, so I'm on his computer. Ha... He hates it when I use his computer. (Evil laugh... I'm going to spill water on it...). Actually, one time I DID spill water on Eric's old Dell--it was when we were first dating, so I think he was afraid to get too angry with me. I felt terrible, but it worked just fine after we dried it out. I guess there is precedent, then, for him to not want me touching his e-baby. This is, essentially, why we bought the house. We LOVE this staircase. I washed it down when we were there, and it's so beautiful. This is Eric's Man-Cave, though it's less a cave and more a finished attic space. Right now, we're having some issues with there not being proper ventilation on the 3rd floor, so it's wicked hot up there. But we will fix that problem, and Eric can put up sports pictures and team pennants to his heart's content. He's looking to buy a large sectional sofa. So long as it's not black leather or something equally tacky, I'm fine with that. Ahhh, the master bedroom! Yes, that's a fireplace! It doesn't work yet, but I'm okay with that. This is the dining room, pre-destruction. You can just barely see the damage on the ceiling--that extended all the way down the wall on the right side. YUCK! But as you can also see, this room has that awesome dish-rail that goes all the way around. We tore all that off, but saved it. We'll put it back up as soon as we have walls. This is the living room. We're going to replace the tile in the fireplace, which is hardly even attached right now. I'm thinking something antiquey-looking and green. Eric will, at some point, construct some built-in bookshelves and an area for a tv under the windows. Oh yes, another view of the stairwell. This is the other reason we bought the house. That window is original, and is about 8 feet tall. The only bad thing about it is that it looks at the house next door. But even so, we love it. Some of the detail--half wall separating the foyer and living room. Yes, yes. I admit willingly and enthusiastically that I've spent the last two hours watching videos of dogs on airplanes, eating lemon sorbet and doing a face mask. What of it? But I also talked to my sister, who requested more pictures. Here they are. Another picture of our little buddy Spike. Look at that sweetie face! Eh, another view of the kitchen, this one without the appealing exposed brick. As you can see, the kitchen needs a wicked big amount of work. We took down several cabinets that were above this little "peninsula," which were mounted on this crazy huge bulkhead that was totally ugly and poorly plastered to boot. That bulkhead wrapped the whole way around the kitchen, and made no sense. We just decided to start over and just re-drywall the whole thing. It will be better this way. Worst kitchen design EVER. Looking into our lovely foyer from the living room. I LOVE those half walls, and the windows are so great. We're planning on staining the floors a dark dark brown and then getting them super shiny. How great will that look??? I'm also planning on removing the chair rail that our predecessors mistook for crown molding, and then painting the walls yellow. This is what is left of our master bathroom. Formerly, it had a shower stall that was so weird--had two benches, and about one square foot to stand. And it was too shallow. So we're going to build a walk-in here. We're also going to put a shower stall in the guest bath, which you can see if you look through the studs... In there, the toilet is in the bathtub, and once it's reinstalled, we'll remove the tub, put the stall in, and then hook up the washer/dryer in there, too. Will be good. We were considering putting the W/D in the hallway closet (there's a neat built-in there), or in the third bedroom/den (which will be my office). But then I decided I didn't want to do laundry in the hallway, and I didn't want to give up my office. So... easy decision. Yes, the one-time joy I found in moving my legs more quickly than normal has completely and entirely dissipated, and has left in its place some creaky joints, sore feet, and a red face. Sigh. So, we ran like the wind (a gentle breeze, if you will) for the first mile or so, until we turned the corner on Memorial Drive and entered into a super sunny stretch. I was already dragging, so Ash kept on going while I slowed down and just tried to not fall into the Charles River (from which I would have no doubt emerged with three arms or no hair...). Made it to the end in NOT LAST PLACE, and Ashie and Eric were waiting. Eric then informed me that "I didn't want to tell you, but I knew this would be a difficult race for you." Because I haven't been running. To which I responded, "Thank you, Eric--I appreciate your insight." Gah. What a totally unnecessary comment. Anyway, we wore our Morrissey t-shirts (see left--swoon), and that was pretty much the highlight of the race. AFTER the race, however, we hit up all of the booths. Whole Foods really put on a spread, so we got some granola bars, salad, drinks, etc. We also made the unwise decision to follow a run with cheese, Greek yogurt, fro-yo and sherbet... Because dairy is the best thing to eat after you run, of course. We then sat out on the Comm Ave. Mall for about and hour and enjoyed the endorphins, free cookies, and sunshine, as well as pointing out how cute peoples' dogs were. And I actually felt really good, so despite the misery that was the number of minutes that it took me to finish the race (which I'm not telling), I'm going to start running again. Ahhh, what a day.